Mexican immigration authorities will begin granting humanitarian visas to a caravan of 3,000 migrants massed at the country’s southern border, but only in small groups each day, according to Mexico’s ambassador to Guatemala. Ambassador Luis Manuel Lopez Moreno said Friday that border officials will allow 100 migrants per day to cross into Mexico, where their asylum petitions will be reviewed. Migrants whose cases are approved will be given asylum visas, which allow them to continue their journey to any point northward, including the U.S.-Mexico border. The caravan is the second large group of migrants to attempt to reach the U.S. border through Mexico this year, following a similar procession in April. In response to the earlier group, U.S. President Donald Trump accused Mexico of enabling illegal immigration and ordered thousands of national guard troops to the border in support of law enforcement agents, a deployment that continues today. Trump has reacted in similar fashion to the newest caravan, threatening foreign aid cuts to Central American governments for failing to stop the outflow of migrants. On Thursday, Trump called on Mexico to stop the “onslaught” of migrants and threatened to use the military to “close the border” if the caravan is allowed to continue its journey north. As the caravan neared Mexico’s southern border, the Mexican government sent planeloads of federal police to the area and warned any caravan migrants entering the country “in an irregular manner” would be arrested and deported. But authorities also said migrants who wanted to pursue asylum claims would be given a chance to do so. “These people are in great need. The border is not closed, we are open to receive them with order and according to the law,” Lopez Moreno said in an interview with The Wall Street Journal. Under the process outlined by the Mexican foreign ministry, immigration officers will interview asylum in groups of five. While the cases are evaluated — a process that typically takes up to 45 days — the migrants must wait in the area and check in at migration centers every week. Once approved for an asylum visa, the migrants can go anywhere in Mexico they choose. 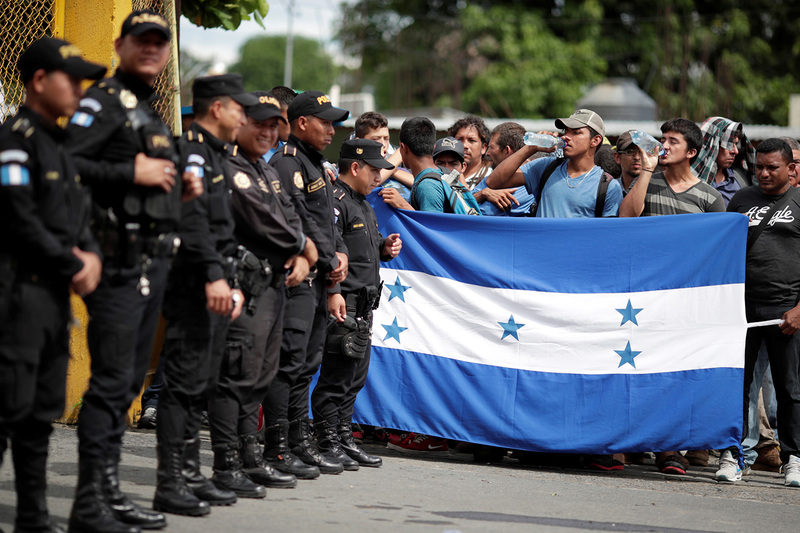 Meanwhile, Mexican authorities have asked the United Nations refugee agency for assistance in setting up a migrant processing center near the Mexico-Guatemala border. The plan was announced as U.S. Secretary of State Mike Pompeo arrived in Mexico City for a meeting with Mexican President Enrique Peña Nieto. The migrant caravan is on the top of the meeting agenda, Department of State officials say.